Good Grief - in times of severe rain, how does that umbrella, four feet above her head actually protect her from the elements? It looks more like a desk ornament when complete with traffic girl. From what I read the umbrellas are mainly for sun protection. They could still don a rain poncho if needed. Here's another picture of the new podiums - click on the picture to see it much larger. Another thing is that in a city of such straight lines and rectangular buildings, the introduction of a curved element may be a bit of a relief. I'd like to see the changing of the TG guard with those new platforms. They're kind of silly looking. All that effort into designing building and maintaining them - why not just turn on the traffic lights instead? Because umbrellas and traffic girls don't require electricity to operate. I would love to see what happens to that thing in a good strong wind, it'd probably tip over and then get blown down the street. Blasphemy! That would eliminate the Traffic Girls! International Online news: North Korean capital, Pyongyang has recently appeared in the streets of a new landscape. All major traffic junctions are equipped with new style of traffic booth, white circular base stood a silver pillar, pillar prop up a blue umbrella, is very noticeable. 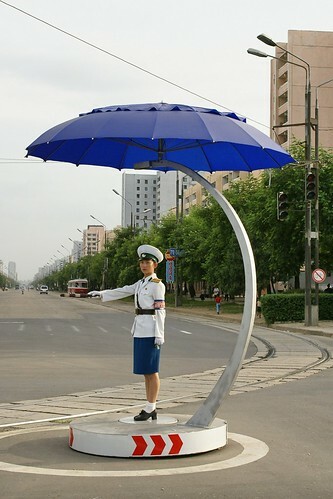 This traffic is not only shade rain guard post, but also equipped with lighting fixtures, to the night-duty traffic police to provide a great convenience. In addition, the booth also features heating device, the traffic police can prevent cold feet in winter. 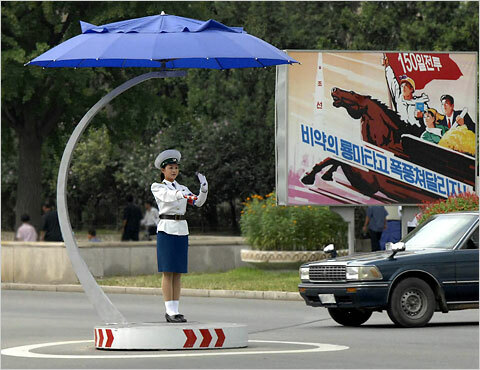 Pyongyang city traffic police traffic control borne mainly by women. The selection and rigorous training at every level of the female traffic police side Zhuang Xiuli, command and action standards, elegant, becoming the city's unique landscape and a symbol of tourism Aspect. According to North Korea's "Labor News" reported that Pyongyang's female traffic police work hard to be the country's special care. They can get a more adequate rest time and more educational opportunities, but also according to different seasons dispensing uniforms, raincoats, boots, sunglasses, gloves, shoes and hats and other supplies, and even the Korean cosmetics brands are the countries products. Somehow, I don't believe the assertion that these platforms have lights or heating devices. That would mean it would have to be hooked up to utilities which I doubt is the case. The more I look at this thing, the sillier it appears.